Measuring the offsets in the field. To catalogue the morphologic offset elements caused by the tectonic activity of the Alhama de Murcia fault including, in the inventory, the scoring of each offset. The geomorphologic analysis is done in a Digital Elevation Model (DEM) created from a point cloud recently acquired with lidar. Most paleoseismologic techniques are designed on and for fast moving faults and are hardly applicable to slow moving faults. The studies which take place in fast moving faults focus in relatively small offsets caused by few seismic events, whereas in slow moving faults individual events cannot be identified as external geodynamics tend to mask them. Although the existing procedures include criteria to score the quality of the offsets, these criteria sometimes are vague and mix subjective and objective criteria. Illustration of the associated morphotectonics scoring for the AMF. The defined boxes are the intersection area between the width of the AMF fault zone (40 m) and the search radius circle around the central point of the feature of half of the offset measurement (u) plus 200 m. Each offset is indicated by the different colored boxes and circled point score. For example, the uppermost (orange) feature has 12 points because the deformation occurs within the fault zone and there are two morphotectonic features (fault parallel valley and scarp) spatially related with it. To qualify the offsets, we differentiate between objective and subjective qualities, and we determine three objective parameters (lithological changes, associated morphotectonics and shape) and three shape sub-parameters (fault zone width, difference in orientation between the two segments of the channel, and sinuosity). All qualities and parameters range from 0 to 1. We identified and scored 138 offsets in the Alhama de Murcia fault zone and, based on the individual Probability Density Function (PDF) of every offset element, we calculate the Cumulative Offset Probability Density (COPD) for the entire fault and for each segment. The COPD was calculated both using the original PDF and the PDFs weighted with the quality value. We compare the COPD of the segments with regional climatic events. The use of a preliminary lateral slip rate (obtained in the paleoseismic trenches at the vicinity of Lorca city) allowed us to infer a relation between channel entrenchment and transitions from glacial to interglacial in the area. Offset shape rating. Three axes represent shape sub-parameters: fault zone width, difference of orientation of the two segments on each side of the fault and sinuosity. Blue lines are the channels, red lines are the fault zones (thickening with width), and green numbers are the shape scoring for every combination of the sub-parameters. Keeping two of the axes constant, shape rating decreases 0.15 points every step in the other axis, making it possible to have values between 1 and 0.1. Our study may be used as a guide to score offsets, as it pretends to unify criteria to catalogue them. 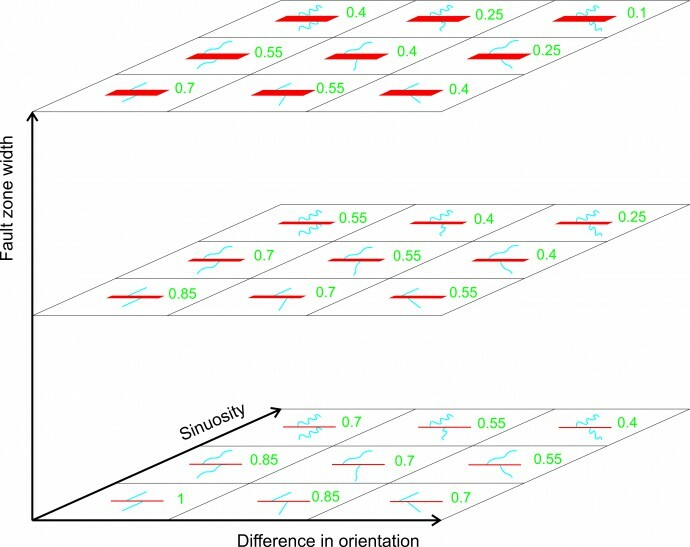 Moreover, it is one of the first examples where the offsets caused by slow moving faults have been catalogued and characterized with this precision. Ferrater, M., Arrowsmith, R., & Masana, E. (2015). Lateral Offset Quality Rating along Low Slip Rate Faults: Application to the Alhama de Murcia Fault (SE Iberian Peninsula). Remote Sensing, 7(11), 14827-14852. Ferrater, M., Booth-Rea, G., Pérez-Peña, J. V., Azañón, J. M., Giaconia, F., & Masana, E. (2015). From extension to transpression: Quaternary reorganization of an extensional-related drainage network by the Alhama de Murcia strike-slip fault (eastern Betics). Tectonophysics 663, 33-47. Ferrater, M., Silva, P. G., Ortuño, M., Rodríguez‐Pascua, M. Á., & Masana, E. (2015). 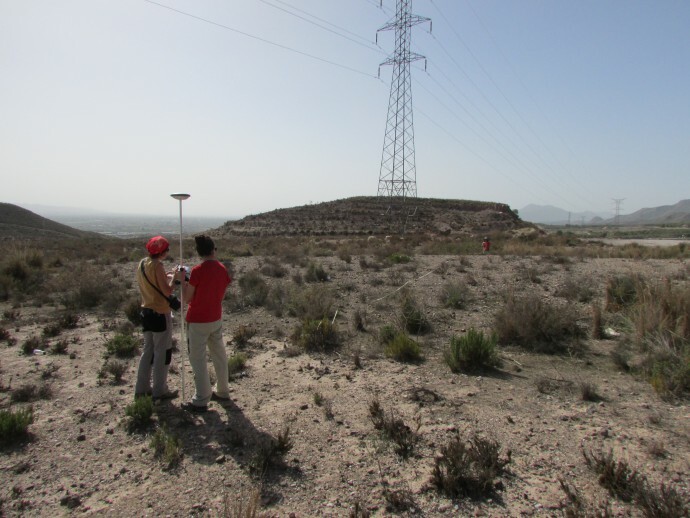 Archaeoseismological Analysis of a Late Bronze Age Site on the Alhama de Murcia Fault, SE Spain. Geoarchaeology, 30(2), 151-164. Find Marta on ResearchGate, on LinkedIn, or visit her UB website.